Ohh I’m so dead after watched this video just now. Yuckie ! That’s really worst. I got a lobe, helix and forward helix piercings. Used a gun. Thanks god my ears came out fine after piercing. 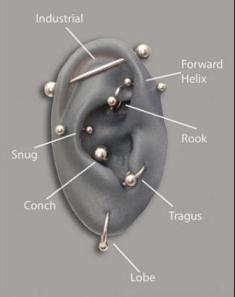 To be honest, I’ve done a helix piercing more than 5times. It doesn’t really hurt much since I’ve done it so many times. When I was 12years old, I’m started to be addicted to piercing. So one night, I told to my sister that I want a helix piercing and others part. We went to one place, and I’ve got my 5 lobes and 2 helix piercings. All seven at the same time. Can u believe it? Darn it I can’t believe. I was only 12years old, still young and I have 9 piercings ! Both ears was hurt at the night. My ears lobe and helix were swollen especially at the helix parts. REALLY REALLY HURT ! I felt like fever and I have no energy. That was the effect for me. It took a week for my piercing to heal but helix is really different. Even it’s been a year you have done it, but you’ll still feel hurt. (Just like mine now) It doesn’t take for a long time for helix’s hole to close up.